Inez, Prestonsburg, Pikeville, Hazard, and surrounding areas make sure to keep your home safe for the rest of this dreary winter season. Water damages can occur at any time to any one. If you need help with water damages call SERVPRO® of Pike, Floyd, & Knott Counties today. The bathroom can be the most moldy room in your home. Want to know why? Remember, if mold finds its way into your bathroom --call SERVPRO® of Pike, Floyd, & Knott Counties today for mold testing. There are many jobs that require you to be out in the elements during dangerous winter conditions (ours included, in some cases). 1. Stay well rested before you know you are going to be doing any kind of outside labor. 2. Stay nourished by eating and drinking enough on the job. 3. Plan breaks from the cold so you can warm up throughout the day. 4. Make sure to stay dry! Use waterproof gear when you can to keep your outer shell warmer. 5. Dress for the conditions so you can adjust to changing temperatures through the day. Always use clothing that can be taken on or off quickly when you need to breathe and let other parts of your skin breath as well (such as ears, head, and hands). We hope you keep these tips in mind the next time you work outside. There's always more to winter working than cleaning up after frozen pipes, so we want you to stay on the know when you are on the go! We are already in the beginning stages of winter weather. Prestonsburg, Pikeville, Inez, and Hazard have been hit with major amounts of snow already. There's not a lot you can do to prevent the snow, but you can prepare your home to better handle these freezing temps. 1. Have your chimney or flue inspected every year. 2. Install a smoke detector or carbon monoxide detector in your home. Check to see if they need fresh batteries every year. 3. Insulate walls and attic --and caulk and weather strip doors and windows. These are just a few ways to winterize your home or business. SERVPRO® of Pike, Floyd, & Knott Counties wants to keep your family safe and warm for the winter season. Water damage can happen to anyone when frozen pipes season comes to visit. When temperatures stay below freezing pipes can build up water and burst when the pipes begin to thaw. 1. Give pipes a helping hand: Open vanity and cabinets to let warmer room temperatures flow through them. 2. Keep water working: allow a small trickle to allow water to run continuously. 1. Shut off water immediately. Don't try to thaw without turning off main shut-off valve for your water source. 2. Thaw pipes with warm air. You can melt the frozen water in the pipes with hair dyers and space heaters. But, do not leave space heaters unattended to do all the work --they can cause open flames. 3. Be careful turning water back on in your home. Once pipes are thawed slowly turn water on to keep water from causing any water damage to your home or business. What happens when you have an emergency water or fire damage, with no insurance claim or a too high deductible, to pay for it? SERVPRO® of Pike, Floyd, & Knott Counties offers financing. We have a financing program to help you out in your time of need. We have this option available because we know our customers need us and emergencies do not wait for finances to be perfect. The longer a water damage sits, the worse the damage. We want you to be able to act fast. We know that when disaster strikes it may not fit your timeline to wait on money from somewhere else. That's why we want to put our customers first and give them a variety of options for payment. Burst Pipe in your home --what do you do now? It's almost that time of the year again when burst pipes are happening more frequently. Shut off the main water valve immediately- This step is critical, as it stops the flooding at its source. Make sure you know where your main water shut off valve is. Pro tip: try tagging the shut off valve so it is easy to spot. You can even call SERVPRO for an Emergency Readiness Plan for your business. Turn off the electric supply- This only applies if the main electrical is not wet. Never touch the electric if you are not sure, call an electrician instead. Do not turn on any TV’s or ceiling fixtures. 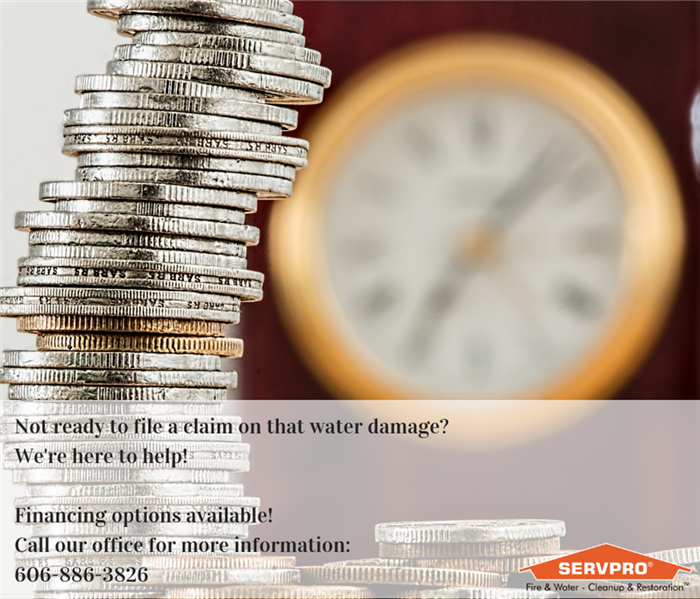 Call a professional to begin mitigation right away- Time is key when it comes to water damage and restoring personal items. You can create a barrier between wet carpet and furniture with aluminum foil. Remove undamaged items from the affected area- To prevent further damage to removable items, take them out of the affected area and allow them to begin drying. 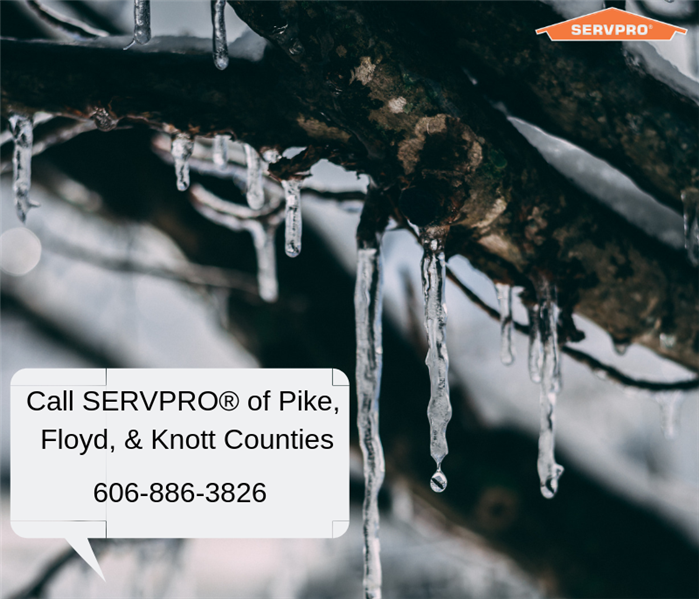 If you needs restoration services after your burst pipes and water damage, call SERVPRO® of Pike, Floyd, & Knott Counties today. Show respect for customer’s home/property. Clean and disinfect equipment regularly. Perform daily, weekly, and monthly vehicle maintenance checklists and equipment maintenance checklists, as assigned. Comply with safety policies as outlined in the SERVPRO® Safety Manual. Utilize cleaning products, mechanical equipment, and personal protective equipment properly. Team members should take ownership of their job responsibilities. Identifying ways to be more efficient is also an important part of this position. When you have a water or fire damage emergency you want a professional to come to your home. That's why you called SERVPRO® of Pike, Floyd, & Knott Counties. Our team has a variety of training and skills to make your emergency have an effective and efficient cleanup process. Our technicians are Water Damage Restoration (WRT) certified, ECTP training certified (Water, Fire, Carpet & Upholstery, and Crew), and on the job training certified as well. Our technicians work side by side with these skill sets to bring you the best of the best. We have a training program in place for our technicians to learn more each day. We have corporate training's in other states so they can bring back the highest knowledge of water and fire damage restoration from the top in the industry. The Crew training that is taught in office teaches our technicians how to treat customers not only one on one but how to be respectful and trustworthy in their homes. We require drug screenings and background checks of all of our employees as part of the SERVPRO standard. We only train the best to trust with your home and beloved items. Our technicians are here to help when you have a water or fire damage emergency. SERVPRO is here to help with your water damage! SERVPRO® of Pike, Floyd, & Knott Counties has water damage restoration trained technicians who know how to help you with your water damage. Until we get there, here are some helpful tips on what to do, keep reading! Use wooden clothespins to hang up clothes, stuffed animals, and photographs that may have been impacted. Make sure that furs and leather items dry separately and at room temperature. Place aluminum foil or wood blocks between furniture and wet carpet. Remove upholstery and cushions for drying. Remove any excess water by mopping or blotting until we arrive. Residents of Pike, Floyd, & Knott Counties --SERVPRO is ready for any size disaster. If your basement floods, call us at 606-886-3826. 12/7/2018 - Does Insurance Cover That? 11/23/2018 - Burst Pipe in your home --what do you do now? 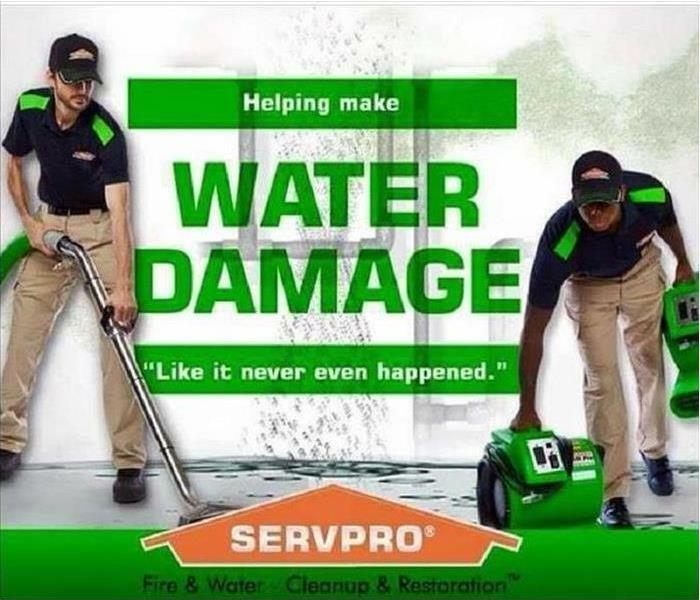 11/19/2018 - SERVPRO is here to help with your water damage!